There were an estimated 305 tornadoes that swirled through the South in late April—a new record. Just what we don’t need—a new record for lousy weather! The Tuscaloosa–Birmingham tornado during the April 2011 event caused at least 65 fatalities. This tornado had a maximum width of 1.5 miles and a track 80 miles long. The outbreak had 2 EF5–level storms, the largest and fiercest tornadoes known. These are the most fatalities from a single tornado in the United States since May 25, 1955, when 80 people were killed by a tornado in southern Kansas (with 75 of those deaths in Udall, Kansas). The deadliest single tornado on record in the United States was the Tri-State Tornado (Mo., Ill., Ind.) on March 18, 1925, in which 695 died. None of these statistics can adequately describe the damage a tornado does. Witnesses wandering in the rubble say that it is as if a bomb were dropped, with whole neighborhoods of housing just completely gone. Over a million homes and businesses were left without power. Six states were put under a state of emergency. There I go again—with statistics—when the reality is that thousands of sad moments when people lose people they love and families lose everything they have fought to build. Statistics are how we retreat from the tragedy and reduce it to numbers. The storm dropped so much water that it is increasing the record flooding on the Mississippi. The Mississippi River continues to rise, so much so that its tributaries are starting to flow backward! The tornadoes of April were so much more than mere statistics, and we will continue to feel their impact. We are located about 100 miles south of where most of the tornado activity happened in April. The closest area to us appears to be Gordon AL. We are 82 miles from Panama City FL. We are deep in drought. We had about 2 inches of rain in April and none in May as of the 10th. We were supposed to have a wetter yet warmer than normal April. And May is dryer yet cooler. This past April was HOT - hitting 88 - 90 degrees every day for the last two weeks, and 80 - 85 degrees the first part of April. But only 2 inches of rain. 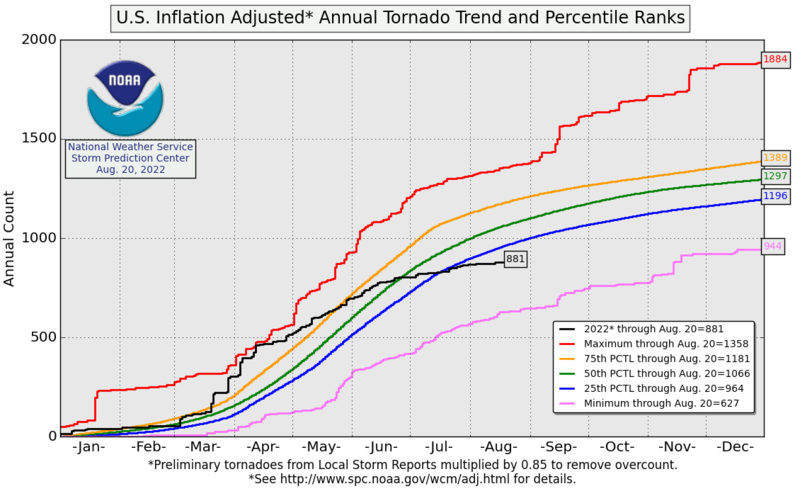 That is very much below the average for April. Today is the 10 th of May and it was 94 degrees here yesterday and looks to be that hot today if not more. This is not cooler than normal for May. Nobody talks about drought. I apologize for putting this comment here on a tornado article. I have found a few NOAA sites that keep up with it. Also, this drought has persisted for 13 years. Do you know if there are any studies as to why the south east corner of Alabama is having this persistent drought while everyone around us is getting some kind of precipitation? Hi, Marian! I put your question and comments to our meteorologist. Here is his response: We appreciate your feedback and want to assure you that we continually strive to improve the accuracy of our long-range forecasting methodology. As you note, we were correct that April would be warmer than normal, although it was warmer than even we thought it would be. And, while we did forecast above-normal rainfall in the region in April and Gordan and other locations in the southeast part of the state had below-normal rainfall, most of the region did have above-normal rainfall. So, we apologize that we did not correctly forecast your rainfall, but it is difficult to pinpoint the exact distribution of rainfall this far in advance. As for your question about why the south east corner of Alabama is having this persistent drought while everyone around you is getting some kind of precipitation, we are not aware of any studies that have found a cause for this particular situation – rainfall distribution can be somewhat random and, unfortunately, most of the rain has missed southeast Alabama. I hope you find this helpful. Thanks for your interest in this Almanac and our predictions.